Roxana Illuminated Perfume will be at the upcoming Comic Convention in San Deigo. The massive event features many notables in the storytelling genre. The booth number for Greg and I is 4704 in the Illustrator's section near Hall G. We will be there with our perfumes, artwork, and music. Possibly the largest convention for popular art culture in the world, Comic Con continues to grow yearly with 150,000 fans attending the four day event. It's a phenomena you can only truly grasp by attending. The San Diego Comic Convention opens to Industry Professionals this Wednesday evening, July 23rd, and to the public Thursday morning. The show and events continue all weekend long, wrapping up on Sunday, July 27th. Concept designer Greg Spalenka, the artist creating the visuals for our perfumes, has been attending Comic Con both as an exhibitor and fan of science fiction and related arts since he was a young lad. This year he will be featuring a 2009 Calendar of his artwork published by Amber Lotus titled Divine Nature. Tickets are sold out, so, probably not a good idea to venture down that way unless you are one of the visionaries who got their ticket(s) in advance. 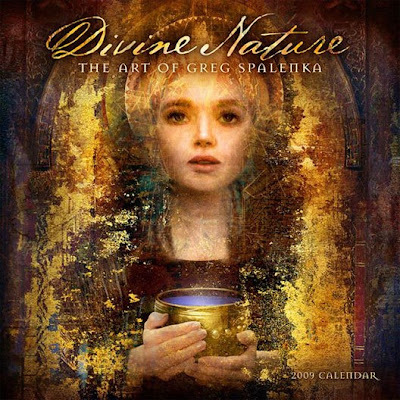 Image above is the cover of the 2009 Spalenka Calendar titled "Divine Nature" ©Greg Spalenka.